Bhopal Development Authority has come up with a new flat scheme under BDA Gharonda Affordable Housing Scheme 2017 at Navibagh Gharonda. It is the first scheme of BDA Bhopal launched in year 2017 and has offering 273 flats for general category. In this scheme, 2BHK flats are available for sale for registration has been started from 2 January 2017. 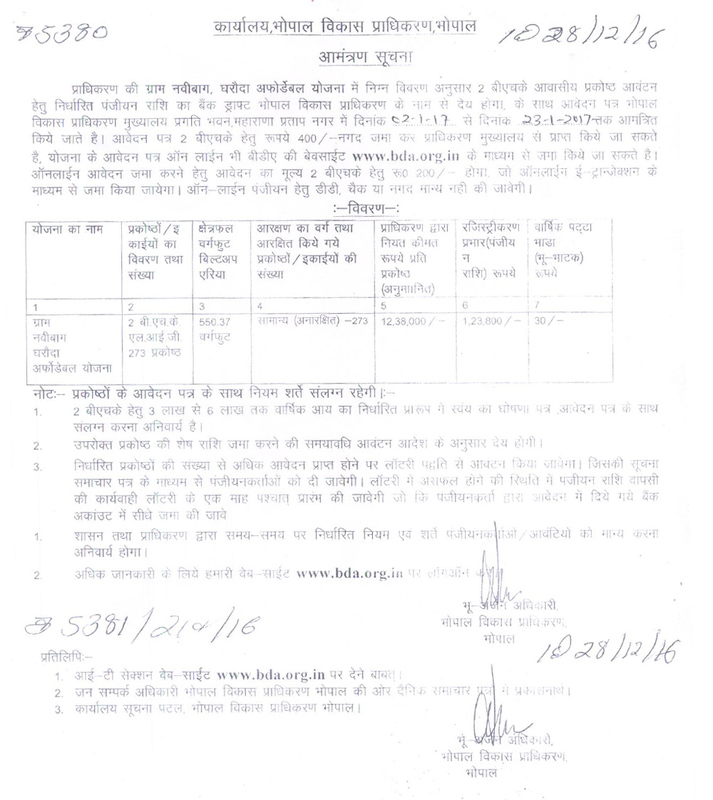 Applications for flats in BDA Gharonda Affordable scheme 2017 are being offered through both online and offline mode and applicants can fill the form according to their convenience. Apart from this, applicants can also register for flats and plots in housing scheme queue below for registration opened till 23 January 2017. For online application visit the official website of BDA Bhopal where you can submit your application and payment for online application can be paid through e-transactions. Application forms are available in office of authority at Rs. 400/- which to be submitted along with registration in the form of DD/cheque/cash before the last date of submission 23 January 2017. For other information visit: bda.org.in.